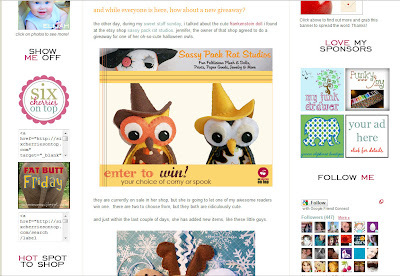 The Sassy Pack Rat: Giveaway! I'm having a giveaway on Six Cherries On Top Blog. Joni was so kind to do a little feature on my Frank plush doll which I mentioned in the post below. When she asked if I'd like to do a giveaway I said of course! So please stop by her blog for a chance to win one of my Mini Witch Owls! Joni was also so kind to put up a photo of my holiday ornaments too. Thanks! I went and entered. I'd love to win one of your owls.